If you are a mechanic or a car owner, then you already know the importance of having a good car jack that does its work properly. Remember, you’re dealing with a device that, if faulty, can pose a life-threatening situation such as when working under a car. Unfortunately, most of the reliable jacks tend to be quite pricey but it doesn’t have to be this way. In fact, for under $100, you can get a dependable tool that is also durable and feature-packed. 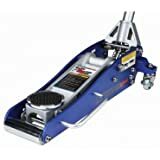 Below are some of the best floor jacks under $100 that you need to check out today. Torin T82751 is a popular car jack that comes with all the features you need in a powerful lifting device. The highly rated floor jack is primarily made of steel although it also contains aluminum. That said, the model is a little heavier than aluminum floor jacks but still incredibly portable. This tool can lift between 5 and 19 inches for a maximum of 2.75 tons. And should you have heavier loads to lift, you may consider purchasing its bigger version which is capable of lifting between 5.12 up to 20.1 inches version. The Torin model comes with an excellent built-in safety overload system which ensures you never go beyond the weight lift capacity. Considering how inexpensive the device is, you will gain a remarkable amount of functionality and good value for your money. To ensure support for its stability, Torin T82751 has caster wheels which also make it easily movable. This jack is suitable for both car and vans and offers a wide stance for easy loading. Some users have reported that Torin T82751 is not suitable for heavy duty purposes. Do you have a truck or heavy car and are looking for a cheap jack to help you in lifting them? Torin 83006 is exactly what you need. This device comes packed with numerous advanced features to make it easier to lift large cars, trucks and even SUVs with pound high-grade steel. Torin 83006 boasts a height lifting range of 5 7/8 to 20 7/8 inches which is commendable for its price. What’s more, it is lighter than most 3 ton filters of the same price range and this makes it one of the most portable floor jacks for trucks you can get in the market. When it comes to portability, this jack by Pittsburgh scores highly as one of the best floor jacks under 100 dollars. Apart from being super lightweight, the top rated floor jack is small enough to fit in your garage or car trunk. Most importantly, it is highly efficient and strong. Pittsburgh 1.5 Ton Jack is made using original aluminum which gives it ample strength and durability. Additionally, its handle, which is also made of aluminum, will impress every mechanic who needs a rapid lift with just 3.5 pumps. This devices features a lift range of 3.375 to 14.75 inches and also comes with rubber saddle to ensure no marring. Might be a bit flimsy depending on the use. The first thing you’ll notice about the Hein-Werner HW93503 floor jack is a saddle column that offers ratchet action height adjustment. 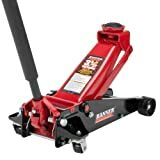 This American made floor jack is arguably our best floor jack under $100 that’s capable of accommodating up to 3 tons. Better yet, it offers a multi-position ratchet bar to ensure strength and durability. The model is incredibly stable, thanks to its flat base that also prevents shrinking in pavements. The colorful looking jack stand may seem like a regular jack, but soon it becomes clear that it’s one of the best for its price. Its legs feature a metal footing to ensure that weight is spread evenly. HW93503 has a maximum height lift of 19 inches and a minimum of 12 1/8 inches. Some users feel that the lift height is a bit inadequate. The Blackhawk floor jack may sound a bit heavy at 85lbs; however, considering that it’s built from heavy duty steel, this floor jack is durable and capable of lifting loads of up to 3.5 tons. It has a bypass device to prevent damage from over-pumping and also works on fast lift technology for quick lifting to help you save on time. Other remarkable features you’ll enjoy with Blackhawk B6350 include overload protection as well as specific wheels which make it easy to move it in around. Also, you can position the jack without any hassle all thanks to swivel saddle and the rear caster. B6350 comes with a unique design and is well suited for lifting any vehicle, whether a sports car or a heavy duty truck. To offer easy storage, this device comes with a two-piece pump handle. 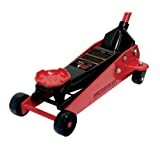 Floor jacks are handy devices that will help you when doing car repairs and maintenance in the garage. Unfortunately, it’s not always the easiest of tasks getting one that suits both your needs and the pocket. If this sounds like a situation you’re going through, then our best floor jack under $100 list wouldn’t have come at a better time. Buy one for yourself and let us know your experience with it in the comments below.